The Avenue of the Arts in Philadelphia is exactly what its name suggests: a home to the arts. From theater and film to music and dance to museums and galleries, some of the city's and state’s finest art organizations call Broad Street home. Included in these organizations is the Wilma Theater, a non-profit theater with the mission to create living, adventurous art. 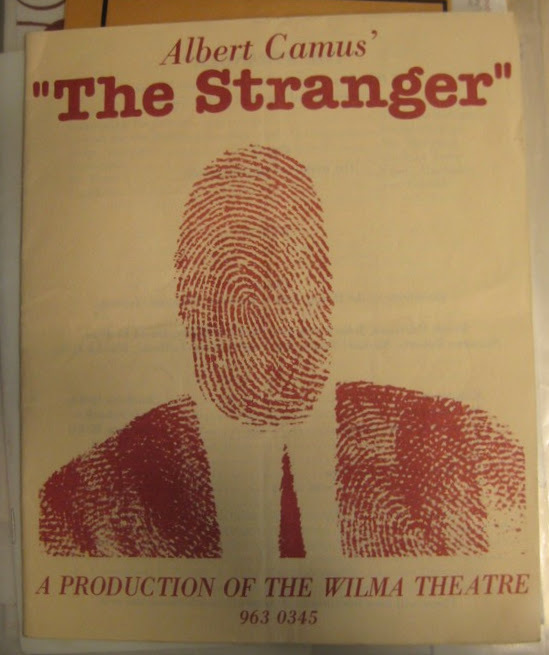 The Wilma Theater began 1973 as the Wilma Project, a feminist collective named after an invented sister of William Shakespeare, inspired by Virginia Wolf’s In a Room of One’s Own. 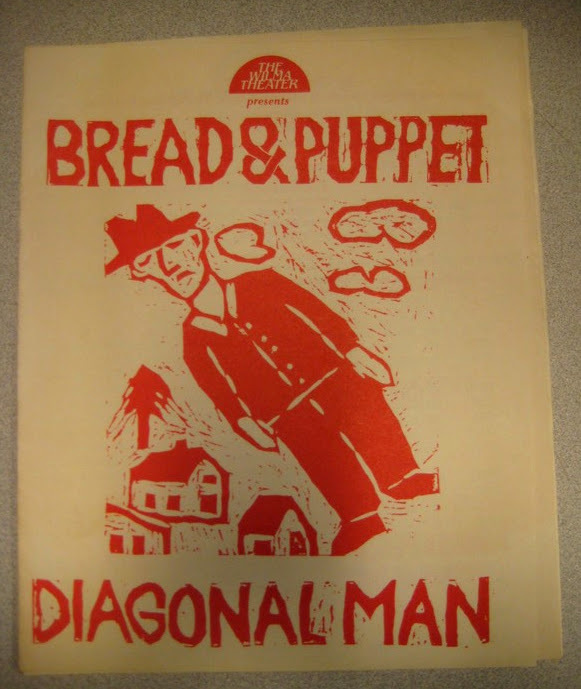 While the Wilma Project, the Wilma presented numerous works with renowned avante garde theater artists such as the Bread & Puppet Theater, The Wooster Group, and Charles Ludlam’s Ridiculous Theatrical Company. Blanka and Jiri Zizka began working with the Wilma Project in 1979, and in 1981, the Czechoslovakian-born couple assumed artistic leadership. Under the Zizkas, the Wilma Theater continued to grow and expanded. The Zizkas moved the Wilma Theater to a small, converted theater space in 1981 but they quickly outgrew this space. To support their growing audience, the Wilma Theater created their current facility at Broad and Spruce Streets, designed by renowned theater architect Hugh Hardy. In this space, the Zizkas further expanded the Wilma, establishing a national reputation for the provocative works they created and the unique theater experience they cultivated. 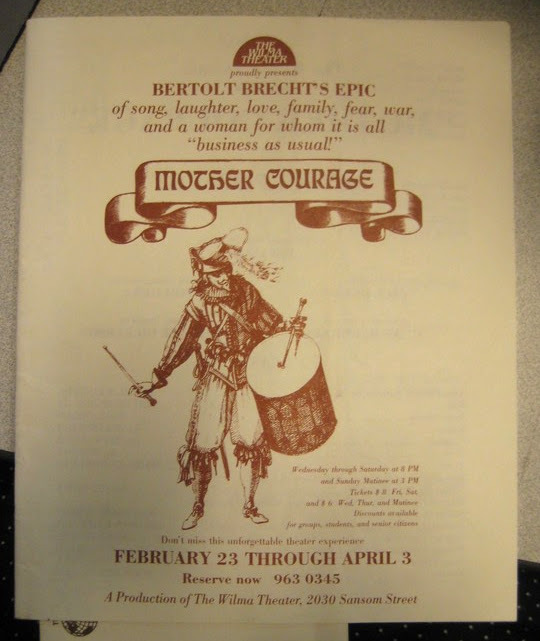 Productions by the Wilma include works by both national and international writers, including Bertolt Brecht (Mother Courage), Tom Stoppard (Rosencrantz and Guildenstern are Dead), Stephen Sondheim (Passion), Paula Vogel (Don Juan Comes Home from Iraq), Tony Kushner (Angels in America), and Athol Fugard (My Children! My Africa!). Their success is illustrated by the multiple Barrymore Awards for Excellence in Theater (also known as Philadelphia’s equivalent of the Tony). 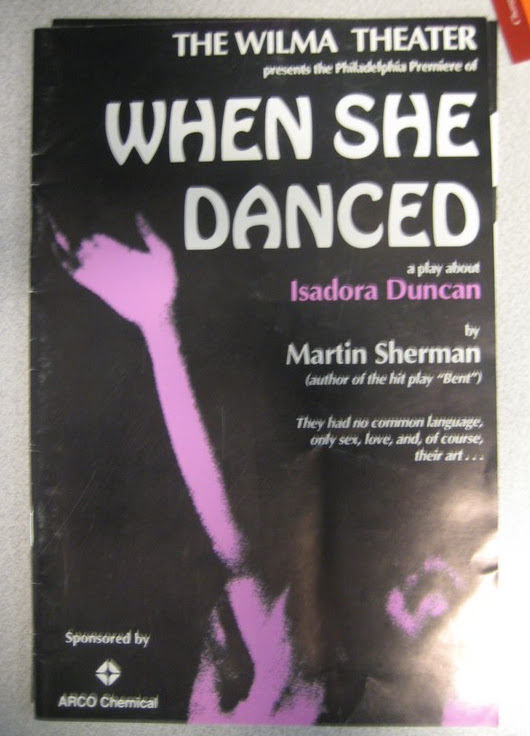 A selection of playbills from Wilma Theater productions. 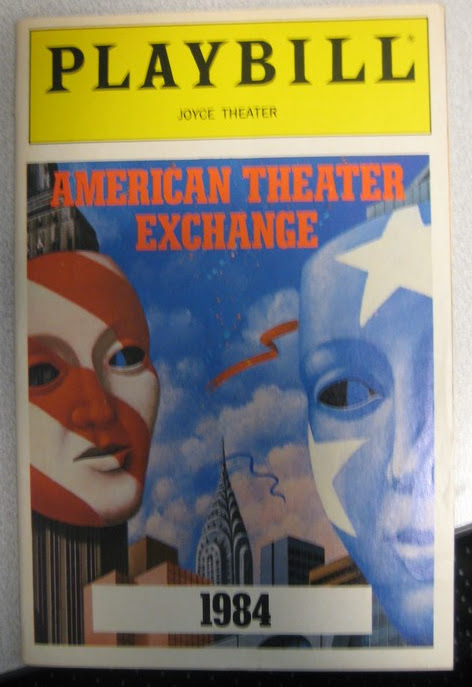 The Wilma Theater's archives are a magnificent place to experience the exceptional nature of the Wilma, through playbills, photographs, production notes, and various other materials. One of the more fascinating aspects of the Wilma’s records are the production binders, the active working files kept by the director during a production. While surveying, we explored the contents of one set of production binders from 1986 for the Wilma’s production of 1984. 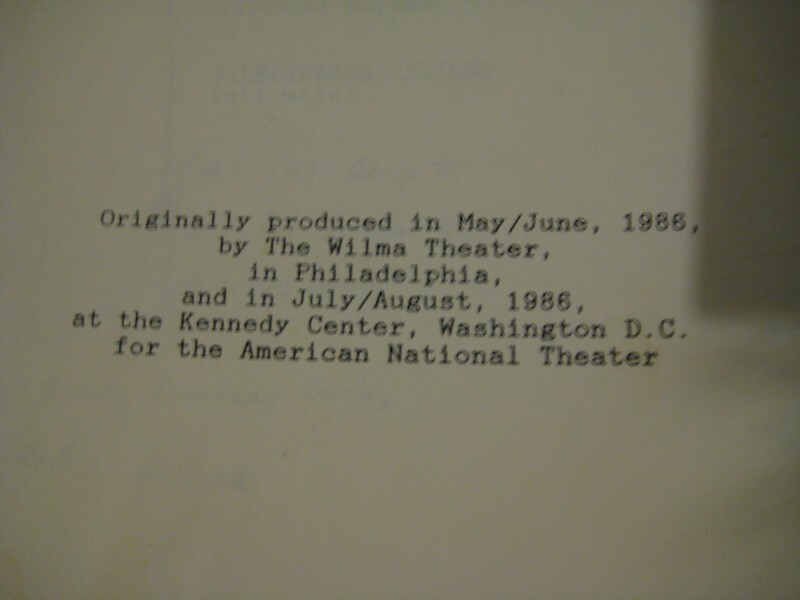 The Wilma presented 1984 not only in Philadelphia, but also at the Kennedy Center in Washington D.C. for the American National Theater. 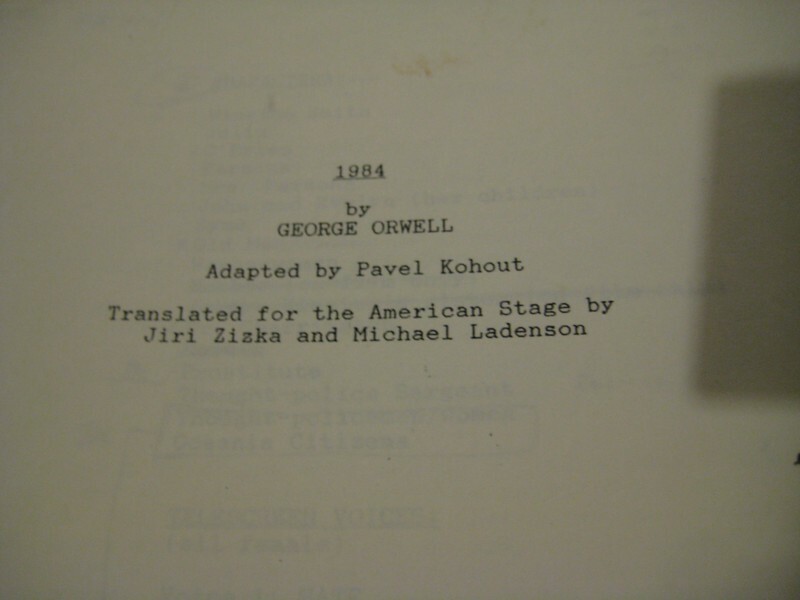 Based on George Orwell’s dystopian novel, the plot was adapted by Czech playwright Pavel Kohot, translated by Jiri Zizka and Michael Ladenson, and directed by Jiri Zizka. 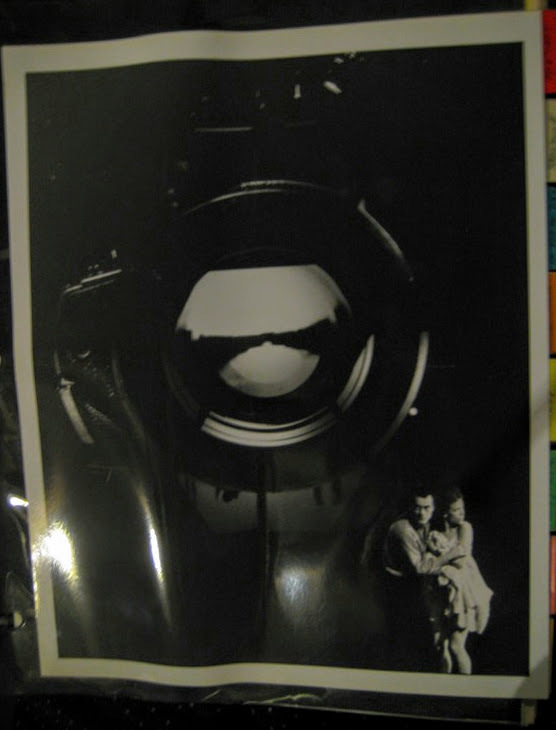 The production binders associated with 1984 (of which there are many!) 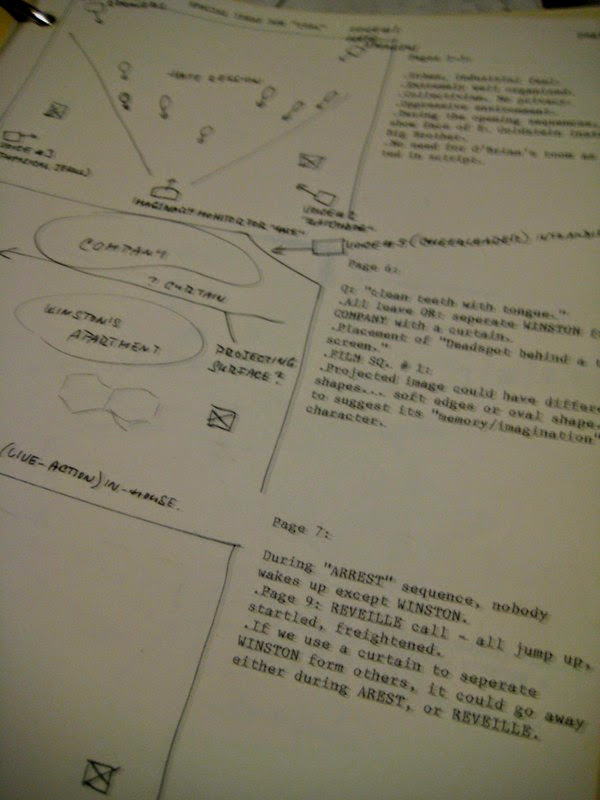 provide a record of Jiri’s process of bringing the play from the paper to the stage. There are notes, design sketches, casting information, lighting cues, photographs, and staging information, among other things. It is a fascinating look at the artistic process of bringing 1984 to the stage. 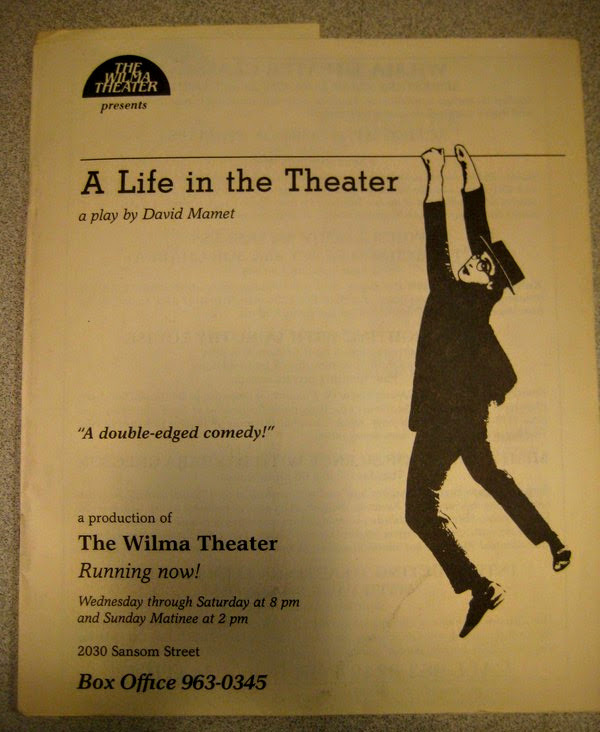 If you’re looking to learn more about theater in Philadelphia, the Wilma Theater is a great place to start. Check out their archives to learn more about the works they’ve brought to the Philadelphia stage! The Historical Society of Pennsylvania is nearing the conclusion of Historic Images, New Technologies (HINT), a two-year project to enhance the description and discovery of its graphic materials and promote the linking and sharing of content among institutions and scholars. The project’s overall objective is to make archival graphics more accessible for online users and to encourage other repositories to adopt the new tools and practices. As such, HINT involves several complementary parts. The Historical Society of Pennsylvania (HSP) is proud to announce its new status as a FamilySearch Affiliate Library. Every year, millions of people around the world comb through books, scour newspapers, and thumb through manuscripts searching for information about their family’s history. What starts small often becomes enormous. Many now-avid genealogists recall their humble beginnings – the discovery of a trunk full of photographs in the attic, or a question about a great grandparent’s country of origin. For many, these humble questions blossom into a lifelong pursuit connecting them to a growing community around the world. One of the most interesting articles I have come across randomly browsing the Internet discussed last meals of famous inmates on death row. There are several outrageous feasts, but the most popular food of choice is apple pie a la mode. Why, you might ask? To many, apply pie is quintessentially American. Yet its unmistakable scent holds specific memories. Memories of Thanksgiving and Christmas evenings spent gathered around the table with my large family. My mouth is watering as I write this post, as I am thinking about the remainder of this pie in my refrigerator and how I cannot wait to heat it up in the microwave when I go home. Other favorite desserts of the thirteen colonies were different variations of puddings, mini cheesecakes, bread puddings, and candied fruits. Apple pie dates back to the 14th century, printed in a recipe book by Geoffrey Chaucer. It was referred to as "English pudding". 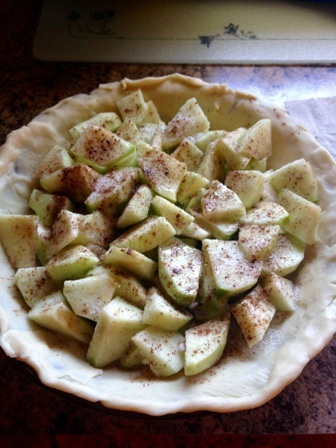 This first variation consisted of a pastry crust, apples, figs, pears, & raisins. Interestingly, the British recipe did not call for sugar. It is believed the pears were to provide the sweetness; sugarcane, at the time, had to be imported from Egypt and was very expensive. 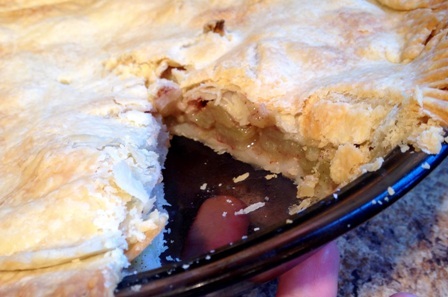 Apple pie began to appear in America in the 17th century. Like the cookbook of Hannah Glasse profiled in my previous post, Amelia Simmons's cookbook was published during her lifetime. However, HSP’s copy is a modern facsimile, so I was not as afraid to touch it as I was with Glasse’s book. 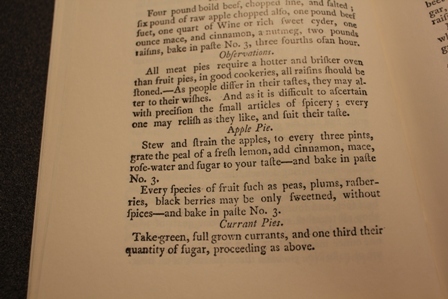 This book is significant because it is the first cookbook published in the 13 states upon its publication in 1796. Before that, the cookbooks in use were British or were shared through families, such as that of Martha Washington, also featured in a previous post of mine. The recipes combine British methods and tradition with American products, as different ingredients were available on these different continents. The book is also important as it calls for a chemical leavening of bread, a novel idea. This ingredient is an ancestor of modern baking powder. Bread was normally leavened with yeast at the time. Very little is known about Amelia Simmons, other than that she was an orphan who may have lacked formal education. She paid the publishing and printing costs of her cookbook herself, as the title page says "For the Author". It was not bound in hard covers. This cookbook was very simple to read and understand, which I think just makes it easier to prepare meals the way they were meant to be. Stew and strain the apples, to every three pints, grate the peal of a fresh lemon, add cinnamon, mace, rose-water and sugar to your taste—and bake in paste No. 3. Every species of fruit such as peas, plums, rasberries, black berries may be only sweetened, without spices—and bake in paste No. 3. 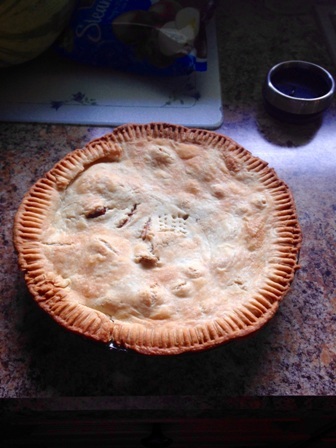 Don’t judge me—after the lettuce tart I decided to use store-bought pie crust, not paste No. 3. If you ever want to bake a pie, use Pillsbury. It was so buttery and flakey. Unfortunately, I could not get my hands on mace. I planned to bake this pie after my internship, so I had my mom run to the store while I was here. I told her to look for mace in the spice section. When I came home, she told me how she was looking for pepper spray. I love how she is concerned for me living and going to school in North Philly, as that is why she assumed I meant pepper spray. I improvised with some nutmeg, as mace is the shell of a nutmeg. Rose water is not so easy to come by, either. It was used to add flavor to recipes, so I tried a drizzle of melted butter. This pie is delicious in its simplicity. It had the taste of conventional apple pie, but not so much artificial sweetness. It’s like a clean-eating apple pie (if pie can be clean-eating). My mom said it didn’t feel like she was eating a load of junk. 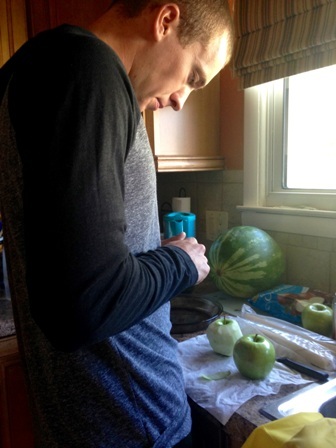 Besides preparing the crust, I also dreaded peeling the apples. Simmons doesn’t specifically say to, but I always do when preparing my cinnamon apple topping for crepes. For this task, I enlisted the help of my boyfriend. Colonial women most likely had their daughters helping them in the kitchen, so I felt justified in requesting a little help too! He decided not to conform to traditional vanilla and ate his apple pie with coffee ice cream on top. It’s all we had in the freezer, but you can use whatever flavor ice cream you please. I actually enjoyed baking this pie, and I normally much prefer cooking to baking. Maybe it's because I cheated with pre-made pie crust, but either way I liked the feeling of preparing a simple apple pie the way it would have been done in the 18th century when the food was extremely popular. Simple and without all of the added artificial ingredients. I think apple pie has withstood the tests of time in the United States because Americans love desserts and they love apples; it is easy to prepare and requires few ingredients; and it has become a symbol of patriotism and tradition. As the world increasingly becomes nutritionally conscious, the fate of apple pie as we know it could be in danger. However, as someone who likes to eat as healthily as possible, I have found many variations that provide the same satisfaction. Go crustless and create an apple "crisp" with a granola or quinoa topping. There are also countless recipes for grain-free/gluten-free crusts using almond meal or coconut flour. Then make the filling similar to mine, nothing but apples and spices, and perhaps substitute the sugar for all-natural Stevie or honey! Top it with low fat Cool Whip instead of ice cream and it's complete. Keeping the legacy alive. 14. Serve warmed, topped with whatever toppings you would like! The Historical Society of Pennsylvania is proud to announce two enhanced tools designed to support online research and exploration of our collections. Discover, HSP’s online catalog, contains records describing printed materials, archival collections, and digital records associated with our collections. It is a researcher’s first port of call for discovery of HSP’s 21 million items. New functionality, enhancements, and data updates in this version make finding the information you’re looking for easier than ever before. HSP/LCP Fellow and PhD Candidate Kathryn Falvo discusses the Vegetarianism movement and the Bible Christian Society in the 19th Century. The Bible Christian society was the largest group of vegetarians in the United States. PHILADELPHIA, PA – This fall, The Historical Society of Pennsylvania in partnership with professional genealogist Sydney F. Cruice Dixon will host Foundations of Genealogy: Getting Started and Doing it Right the First Time, an 8-week course for family historians and genealogists seeking to become more effective and efficient researchers. Catholicism has a long and noteworthy history in Philadelphia, from the first recorded Mass celebrated in 1707 to the 200 parishes established between 1844 and 1924 and the founding of our nation’s first seminary. It is estimated that currently 35 percent of the population of greater Philadelphia are baptized Catholic, making Catholicism the single largest religious denomination in the area. Now, as the location of the 2015 World Meeting of Families, all eyes are on Philadelphia as it welcomes Pope Francis. Greetings! 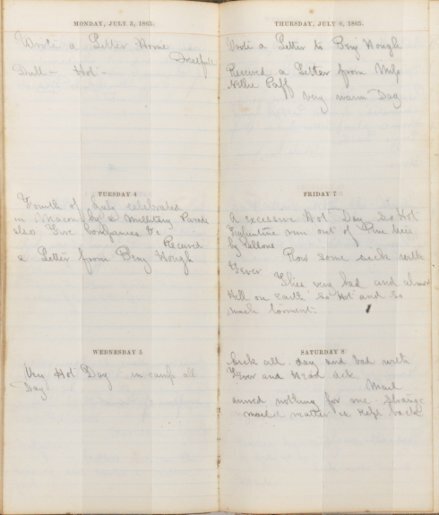 Thanks for coming back for more transcribed entries from the George F. Parry Civil War diaries (George F. Parry family volumes, Collection 3694). If you're just joining us, in 2012 HSP acquired the diaries of Bucks County resident and Civil War veterinary surgeon George F. Parry. In that collection are three diaries he kept during the Civil War dating from 1863 to 1865, when he served with the 7th Pennsylvania Cavalry. 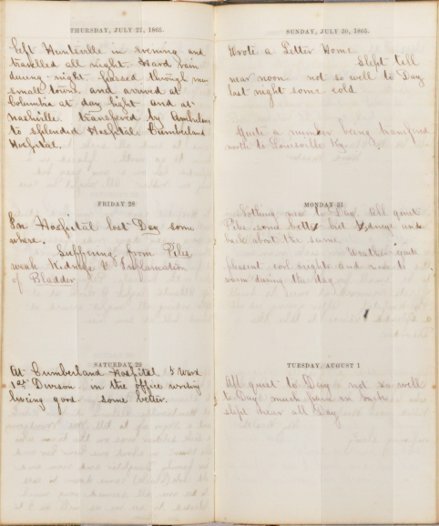 In celebration of Parry's work and the 150th anniversary of the Civil War, I'm providing monthly posts on Fondly, PA of transcripts of entries from his diaries. To see other posts in the series, check out the links over on the right-hand side of this page. Clicking on the diary images will take you to our Digital Library where you can examine the volumes page by page, along with other digitized items from the Parry collection. With the war over, things were winding down for Parry and his regiment. At the beginning of the month, he remained in Georgia, in a camp outside of Macon. And, as he noted in several entries, it was a hot, hot summer. It seems that Parry caught some sort of illness that led him to an extended hospital stay. At the end of the month, he was moved north, based on orders from command, with other sick soldiers. Parry ended up in Cumberland Hospital, a volunteer organization, in Nashville, Tennessee. Notes about the transcriptions: I've kept the pattern of Parry's writings as close as formatting here will allow, including his line breaks and spacing. My own additional or clarifying notes will be in brackets [ ]. Any grammatical hiccups that aren’t noted as such are Parry's own. the property of the U. S. Gov't. hung on rubber. All night in cars.